We have been blending Aleppo pepper with our salt since 2011. The pepper is named after Aleppo, an ancient city along the Silk Road in northern Syria, a UNESCO World Heritage site and the largest city in civil war-torn Syria. We are dismayed by the events transpiring in Syria, especially in Aleppo. 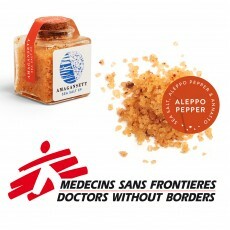 Half of our profits from online sales of our Aleppo pepper blended salt is given to Doctors Without Borders which is currently providing direct medical care in six hospitals and four health centers in Syria, while also sending medical supplies to the areas they can't physically access.